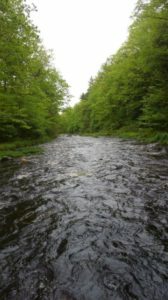 The Souhegan River is a great spot to fish in southern NH. Fish and Game stocks it heavily during the spring with all three species. There are supposedly also wild brookies present. Access isn’t a problem as much of the river flows through public land. With around 30 miles of fish-able river, it can be tough to pick a spot and fish. With long stretches of pocket water, technical glides, and deep pools, there is plenty of water for everyone. This overview will help narrow it down. With numerous bridges, hiking trails, and parks near the river, there are plenty of spots to fish on the Souhegan. However, much of this overview concerns the section above Milford, which is where I do most of my fishing. This is a popular spot to access the river. Easy parking, easy access, and lots of fish. It can sometimes get crowded, although I’ve usually had the whole spot to myself. There is plenty of water above and below the bridge. Much of it is all fast moving pocket water, with a few big pools thrown in. The pool under the bridge is a good spot. You can nymph or throw streamers there. The bridge is pretty low and you can break a rod if you aren’t careful. You can park on the side of the road near Monadnock Water. There is a very large pool under the bridge that fishes well. Fish it with streamers or nymphs.The pool is deep and fast so caution is needed. Below the bridge, the water slows into a riffle, run, pool stretch that calls for a swung streamer or soft hackle. Above the bridge, there is ample pocket water. Fish are everywhere. The road parallels the river. There are many pull offs here. The best part about this section is the Delayed Harvest Area. It starts 300 feet below the Route 31 bridge and ends 300 feet above the Old Wilton Road Bridge. This section is full of fish-able pocket water, and it resembles a White Mountains stream. There are a few holdovers and wild fish in this section. Since the Souhegan is mostly put-and-take, the fish aren’t overly picky. As far as flies, nymphs and streamers are the way to go. In my experience, there isn’t much dry fly action. This river is chock full of caddis and flies such as hare’s ears, caddis pupa, pheasant tails, and soft hackles are effective flies. Attractor dries and streamers can draw vicious strikes from freshly-stocked fish. As with any river, be sure to match the hatch to find the best action. The holdover fish can be picky, as with any other river. You’re welcome John. Do you fish this river often? 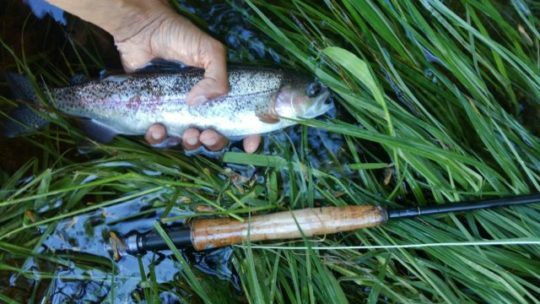 Not FF only but there is a delayed harvest section for quality Trout with a C&R season and artificial single barbless hooked lures and flies regulation applying during this C&R season. This was a great post. Thanks very much! My in laws just moved to Milford. Does the Souhegan fish aright even into the summer months or is it empty after people take off all the stockers? If it helps anyone, I got some more data/information on the Souhegan in the summer. I fished around the intersection of 101 and 101A in July, near the rare coins store. It’s mostly pocket water. I caught a wild-looking brook trout on a hopper near the bank, maybe 7in. I also fished right above the dam in Wilton in early August and caught a couple of rainbows on a chubby chernyobl. Maybe a stocker holdover? No clipped fins and it had good color, maybe 9in. It was a cool day and there were a lot of risers. The water below the dam looked good, but I didn’t work it much with the risers above the dam. Went back today after rain and it was high and fast, risky wading. I fished near the golf course in Amherst. Long, slower runs. Nothing doing (other than sucker fish) for me on a terrestrial + dropper rig and the water felt really warm. Sandy bottom with lots of weeds. I thought I saw risers later in the evening but they were way upstream and I needed to go home. Another website said this area was good but to target areas where the streams entered the river. Will try and update if I get any more data — hopefully others will too! Ok, have fished it a few more times and talked a lot with another guy who’s been doing the same. The area near the Wilton dam has produced fish for us the last week at a decent clip. They hit lots of different things. He’s been mostly dries and wooly buggers. I’ve also caught them on ants under an indicator and streamers. The fish have tended to be in the standard stocker size range with one or two that I suspect grew as holdovers. Almost all rainbows, occasional brook or brown. I’m headed back this weekend (8/25/18) and then will also try the area around Monadnock Water Co to see if it’s still holding fish.